Camping is a hugely popular activity, especially in the spring and summer months. While some choose to go backpacking or car camping, others look forward to getting out their motorcycle and exploring. Camping from a motorcycle can be a wonderful experience, and for many a preferred option over staying at a hotel. Whether you’re brand new to motorcycle camping or just looking for a new tent to add to your gear, here 3 amazing models to choose from. You can really use any tent for motorcycle camping, but if you can choose a shelter designed for motorcyclists by motorcyclists, wouldn’t you? Adventure riders often find that regular tents lack certain features that would be useful for. 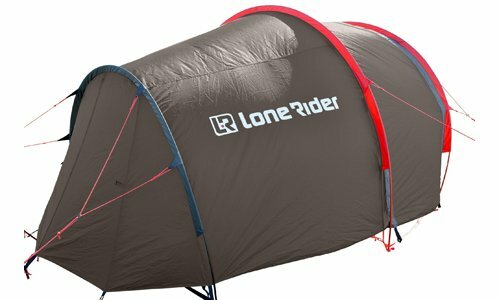 Lone Rider sought to produce shelters that are lightweight and durable, while protecting both rider and motorcycle from the elements. 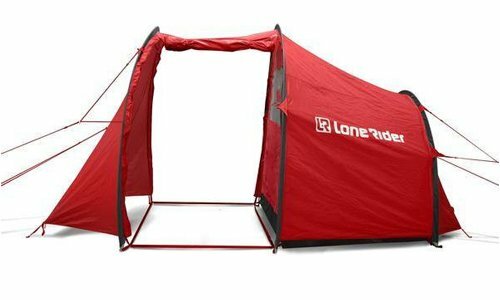 The MotoTent v2 is the current full-size tent offered by Lone Rider. This tunnel-shaped black and red shelter is the perfect size for one or two riders and one adventure motorcycle. The built-in garage keeps your bike out of the rain and allows for a covered space for working on it. Even with a larger adventure motorcycle, there is still plenty of room in this vestibule area to store your gear. Overall the MotoTent v2 is a pretty average 2p tent. One particularly stand-out feature is the option to expand the garage. The detachable inner tent design is genius for working on your motorcycle on the go, particularly in wet weather. Simply remove the inner tent wall to make the tent into one large garage. If you’ve ever had to pull over and work on your bike in the rain, you’ll really appreciate this feature. While the tent does weight 13lbs, which is fairly heavy when compared to normal camping tents, it isn’t an issue since you won’t have to carry the tent any distance. Compared to similar models with a motorcycle garage, it’s on the lower end of the scale. The reason for the weight is a combination of the heavy-duty materials used and the aluminum pieces included. The durable carrying bag adds some weight as well but protects the tent well while remaining compact on the back of the motorcycle. 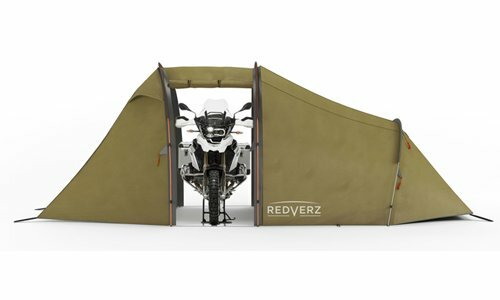 If you liked the idea of the MotoTent v2 being designed for riders, but want more, the Atacama Expedition tent by Redverz is going to need to be on your wishlist. This luxury tent is certainly not cheap but if you’re a diehard adventure rider that really puts their shelter through the ringer, it will be worth every penny. Despite how large and structural this tent seems, it is extremely fast to set up as it only uses 3 poles. There are color coded pole sleeves and clips so even after a tiring ride and sunlight fading, you don’t have to struggle to get into your shelter. This tent isn’t freestanding and is a hoop design. It holds up very well against high winds and sheds rain easily. If you have a larger than average adventure bike, this tent will likely be able to accommodate it, even with panniers left on. There is a door access straight to the garage but also 3 other doors so you can enter and exit without having to scoot by the bike. The extra doors are also useful for camping partners as each person can leave the tent without having to bother the person next to them. Big Agnes has been around for just 15 short years but has already achieved the same level of success as other outdoor companies that have been around for 50+. This company produces a range of different outdoor gear but they’re most well-known for their tents. 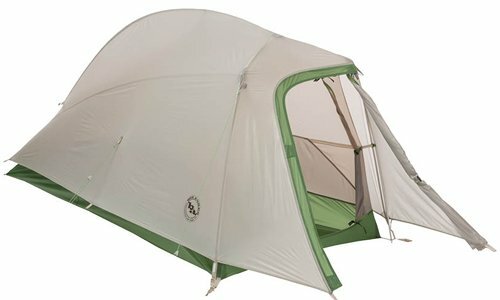 They have a huge selection of different models – from massive 6+ person capacity car tents to durable but tiny 1 person tents designed for serious mountaineering in winter. For the solo motorcyclist, the Seedhouse SL1 is worth a look at. The Seedhouse SL1 is designed for ultralight backpackers but the combination of ease of use, price and reliability make it perfect for adventure riders needing something to keep them dry. Sure, it doesn’t have a garage for your bike, but it more than makes up for this missing feature. If a garage is an absolute must for you, you will be happier with a different model but for the lone rider that only camps out in good weather or isn’t concerned about rain, you can’t get much better than this one. 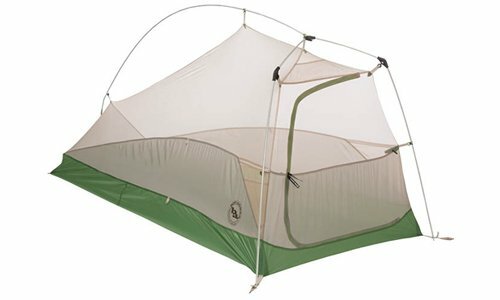 Big Agnes recently updated their Seedhouse SL1 to an improved design, including steeper walls and an added vestibule. The steeper walls help to shed rain better and bounce wind gusts away. It also gives the interior of the tent a more spacious feel. The added vestibule was a no-brainer as having a covered area to remove dirty boots or wet clothes before entering the tent is a priority. A vestibule is especially useful for riders that don’t want to have to change dirty, dusty clothes inside their sleeping quarters. Not to mention a dry-entry vestibule also prevents rain from getting into the tent. Even though this tent only sleeps a single person, it doesn’t have the claustrophobic feeling that many 1P tents have. It’s peak ceiling height is 39″ so majority of people can comfortably move around and sit up inside. Since BA redesigned this model with steeper walls, it feels even roomier inside. Not only did this redesign open up the tent, but it didn’t add additional weight. The vertical shaped entrance/exit door inside the vestibule also adds to the increased volume of the tent. The Seedhouse SL1 is compatible with a gear loft- an excellent feature for the camper who will be out on their adventure for an extended period of time. The triangular gear loft is sold separately, and this will also accept the Big Agnes Entertainment Center loft or PowerCase/Loft. The tent offers enough space already for basic gear storage. There are a total of 3 interior pockets for organizing tools, snacks, and other smaller items. The vestibule is only 5 sq ft but it is possible to keep some items there as well. Just because any tent can conceivably work for a motorcyclist, it doesn’t mean that tent choice isn’t important. 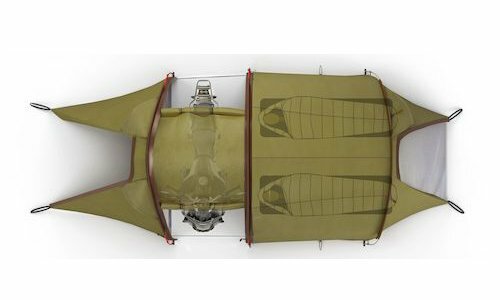 Adventure motorcyclists don’t have the luxury of being able to choose any size or weight tent like car campers can. The time spent on researching tents carefully before purchase will be well worth the effort once you’re out on the road and ready for some shut-eye.